Genesis' Misunderstanding / Evidence of Autumn is one of those singles where the B-side is better than the A-side, although my friends interested in pop music would vigorously disagree. 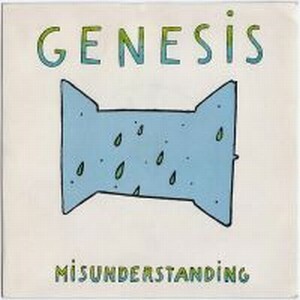 Misunderstanding could be considered the culmination of years of leaning more and more into radio-friendly pop music. This all started with The Lamb Lies Down in Broadway (Counting Out Time for instance) and steadily grew to become more and more prevalent with future releases. Unfortunately for most us, Misunderstanding was just the tip of the iceberg headed our way. I'll admit it's a catchy song, but try listening to it after listening to Supper's Ready or even the Eleventh Earl of Mar. Evidence of Autumn is a Banks number that sounds like it would fit nicely on And Then There Were Three. In the States it would find it's way onto side 4 of the Three Sides Live release and later on some Genesis box sets. It should have been on Duke in place of Misunderstanding. Clearly for collectors, die-hard fans that collect everything, and completionists. Two stars.